It's 5 am when my alarm goes off. My body is numb and unresponsive, unwilling to move from the warm curve of my husband where I've settled. I stumble around and find my contacts, a hair tie, a bra. I shower. I'm headed downstairs for the coffee maker. Its still dark when I pull up to the hotel. Familiar faces greet me, they know I'm coming by my loud heels on the tile. Many a "Buenos dais" are exchanged as I enter by the break room to clock in. There on the time clock, nicely placed, is a little plush dolphin. I flash back to what I must have been dreaming about last night. Blue water turning red, like a plague out of Exodus. I pick up the toy and stoke it. "Whose is this?" I ask some of the ladies from housekeeping, who are enjoying their coffee nearby. "Lost and found, Mami. No one claimed it. It's yours now." "Its so cute," I say, pressing it against my suit jacket. Geradlo is a good friend at work, always smiling, always making me smile. He only knows a little English, and I know even less Spanish, but we always manage to talk anyway. He asks me what I'm going to name it. "I don't know, what do you think I should I name her?" I place her in my purse and tuck it away in the back office. 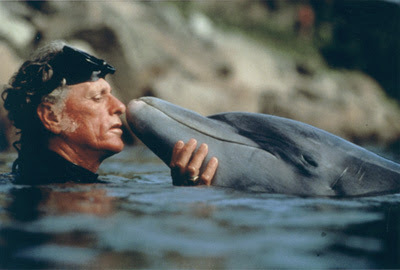 It's been about a week since I was introduced to the work of Ric O'Barry, the Dolphin Man. His testimony is astounding, raw, and challenges conventional thinking about the "animal soul." 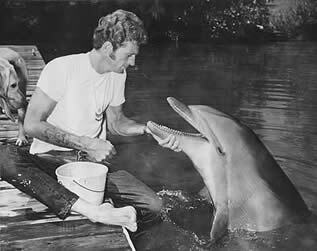 This guy captured and trained the 5 main dolphins that played Flipper in the 1960s TV series. His life changed radically the day that Kathy, one of the dolphins that most often played Flipper, died in his arms. He knew that captivity was causing her to become depressed. "You could see it in her. I knew she was tired of suffering," O'Barry says. "She was living a miserable life and she was tired of being miserable." One day, she swam into Ric's arms. She looked him in the eye, purposefully. Now here is the interesting part: each breathe a dolphin takes is a decision. They're not like us, who breathe without thinking; they have to intentionally surface, inhale and exhale. That's why O'Barry is convinced that Kathy committed suicide in his arms. She looked at him, took a breath, and then chose not to take another. He let her go, and she sunk to the bottom of the pool, lifeless. Ric O'Barry's life took a sharp 180 degree turn. 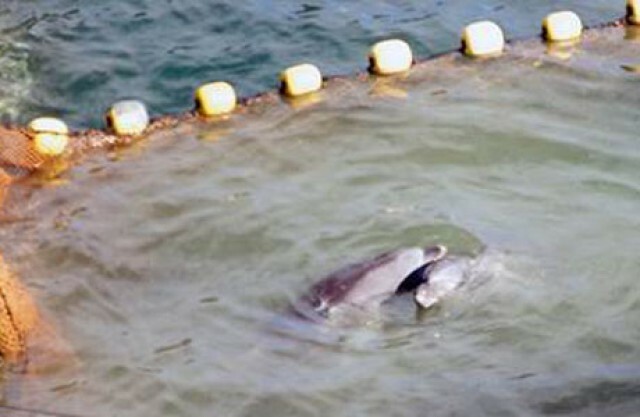 The very day after Kathy's death, he was in jail for attempting to free captive dolphins. And that wasn't the last night he's spend incarcerated for the cause. 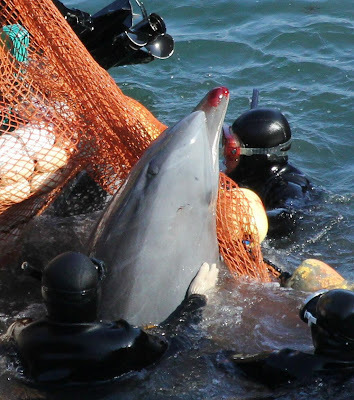 The freedom and safety of dolphins has been his relentless mission since that crucial moment. He travels around the world, fighting for dolphins that are caged or killed, getting thrown in jail, getting out, doing it again. He's basically a total badass. My dog Henry is curled up on the couch between us. I have strawberry frozen yogurt in one hand and the remote in the other, trying to figure out how to work the DVR. Katelyn is a bit more tech savvy than I am, and is able to find the "search" option quicker. We are unprepared for what we are about to see, to say the least. The TV flashes images of a remote Japanese town called Taiji, and a little cove there, protected by angry Japanese fishermen holding up signs which read "NO CAMERAS." The film picks up like an espionage thriller as Ric and his team engineer ways to get video equipment past security in and into the secretive cove. They successfully film the mass slaughter of dolphins, corralled and netted into the cove by Japanese fishermen. The blue water turns bright red. I can see the goosebumps on Katelyn's arms. My mind begins recounting all that I have researched about the minds of cetaceans. The information I have found out so far is nearly unbelievable. I always knew dolphins and whales were smart, but I didn't exactly know how smart. I found out that they are cultural, emotionally complex, self controlled, perceptive and aware. Their brains are highly evolved. They use tools. We have every indication that they use and pass along language, and even call each other by name. Neuroscientist Doctor Lori Marino has spent much of her time studying the magnificent minds of cetaceans. "In addition to showing impressive capacities in the communicative, social, and learning domains, dolphins are among the few species who, thus far, have shown convincing evidence of self-awareness." Blood, like a red cloud, billows behind her as she frantically flops and jerks in and out of the water. She is desperate to escape the slaughter, and she is in pain. She comes up for air, struggling hard, then goes under. She appears once more, briefly, before disappearing under the red water forever.
" (Cetaceans) provide an example of an alternative evolutionary route to complex intelligence on earth," she says. A spear is driven through the Paralimbic Cortex, slowly. There is a part in the whale and dolphin brain that is not present in the human brain. It is known as the Paralimbic Cortex. The Limbic System, which is the area of the brain responsible for handing emotional information, is actually larger and more spread out in dolphins than it is in humans. Dr Denise Herzig concludes that "the dolphin brain may have more of a ‘global connection' to [emotional] information". A mother nestles and clings to her calf, knowing that in moments, she will be slaughtered. Her baby will likely be taken and sold, living out the rest of his life in captivity. As I come home from work that night, I grab my plush "Flipper" doll, Kathy, and hold her to my chest. I wonder what God must think as he looks upon the earth he has given us to protect and cherish, and sees those bloody beaches. 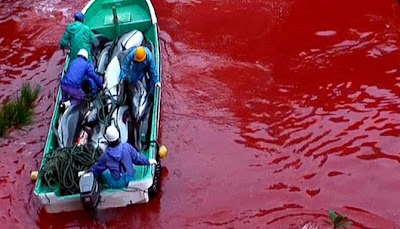 Boats full of mutilated dolphins, whose mercury poisoned meat will soon fill the bellies of unaware Japanese school children. Sensitive and glorious animals that we could not just appreciate and admire, but that we steal and cage and profit from. It's not alright by me. 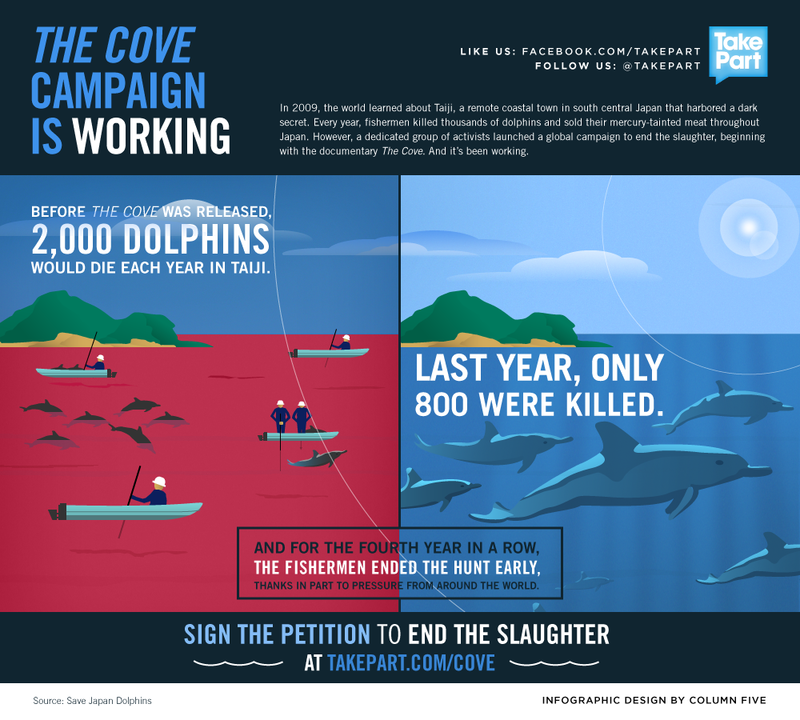 On September 1st, the annual dolphin hunt will commence in Japan. That's only a few days away. Efforts are being made to stop this, and not in vain, but there is a long way to go. You can start with some of the source material below. Me? I'm thinking I may organize an art show. Art has a way of speaking to people. An art show, complete with cupcakes, wine, and deep conversation. I've already getting a head start. 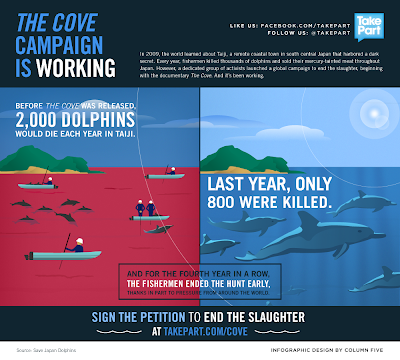 Please watch The Cove, and please take action by visiting Ric O'Barrys website. He is the founder of the Dolphin Project, and they are making a huge difference for dolphins worldwide. Hi! I'm Stephanie. I live in Orlando Florida with my awesome husband Jake and our dog/first child, Henry. I am a painter, illustrator, coffee drinker, comic-book addict, and big sister. I've had killer whales and dolphins on my heart and mind ever since a recent visit to SeaWorld. The more I read and learn about them, the more I have become convinced that it is not right to keep these sentient, social, highly evolved animals in captivity. This blog is a place where I will share the things I'm learning, and spread hope for their eventual freedom! It is my hearts desire that we all would be inspired to make a change. We really should learn to protect and cherish the freedom of intelligent beings. To appreciate things like majesty and might without feeling the need to contain or control them. We humans are hugely unique amongst the animal kingdom. We have the responsibility of caring for and protecting our world. We ought to accept that there are other creatures on earth that are smart, cultural, and important in their own way. I hope these free animals have a spiritual effect on people... that we might see in them a reflection of the goodness, wonder, and enormity of the Creator. So thank you for visiting and reading! Share your thoughts! They are welcome here.